Forrest M. DeGraff, 87, a lifelong resident of Grayslake, passed away Tuesday, July 25, 2017, at Journeycare in Barrington, IL. He was born November 6, 1929 in Grayslake to Dorothy and Anton DeGraff. Forrest was the President of the first class of Grayslake High School in 1947. He joined the US Marine Corps in 1948 and served during the Korean War as a Sergeant and was a graduate from the Molar Barber College. Forrest retired from the Lake County Department of Transportation as a Manager of the Sign and Traffic Department after 31 years of service. He enjoyed hunting, fishing, bank collecting, restoring antique trunks, woodcarving, doing crossword puzzles, playing bingo, going to casinos, traveling, and tinkering in his workshop. Forrest was a fan of the Chicago Bears, Bulls, Blackhawks, but most of all the White Sox. He was a member of the Grayslake Historical Society and served as a Boy Scout Leader. Forrest is survived by his loving wife of 60 years, Joy (nee: Francis), whom he wed in 1957, his children Elizabeth (John) Mullen, Douglas DeGraff, and Ann (Richard) Coles, his grandchildren Jessica (Kelly) Mullen, Kerri (Mark) Thompson, Michael Mullen, and Kelly (Andrew) Nicholson, Scott Coles, Zachary Coles, and Alex Coles, and his sister Shirley Eckhoff. He was preceded in death by his parents and his brother Leonard. A visitation and memorial service is scheduled for Saturday, August 5, 2017 from 10:00am until 1:00pm with the memorial service commencing at 1:00pm at Strang Funeral Chapel & Crematorium 410 E. Belvidere Rd. Grayslake, IL 60030. Interment will be held privately. For more information please contact (847)223-8122 or log onto www.strangfuneral.org. Pearl R. Lambert, 73, a resident of Round Lake Beach, passed away Sunday, July 23, 2017, at Hillcrest Nursing Home in Round Lake Beach. She was born June 30, 1944 in Casper, WY to Raymond and Pearl Rowling. Pearl loved sewing and crafting. Pearl is survived by her children Shari (Andy) Levandowski, Jack (Sara) Lambert, Michael (Mary) Edwards, and Raymond (Liz) Edwards, her 8 grandchildren, her 7 great-grandchildren, and her sister Muriel Morris. She was preceded in death by her parents, her brother Leslie Waumbugh, and her sister Nancy Lewey. A memorial visitation is scheduled for Thursday, July 27, 2017 from 5:00pm until 7:30pm with a memorial service commencing at 7:30pm at STRANG FUNERAL CHAPEL & CREMATORIUM, 410 E. Belvidere Rd., Grayslake, IL 60030. Interment will be held privately. In lieu of flowers, memorials may be made to Hillcrest Nursing Home 1740 Circuit Dr. Round Lake Beach, IL 60073. For information, call 847-223-8122 or visit www.strangfuneral.org. Katherine J. Wandall, 80, a resident of Grayslake, passed away Saturday, July 22, 2017, at her home. She was born September 11, 1936 in Chicago, IL to Walter and Kathlyn Sheahan. Katherine is survived by her children John (Carol) Wandall, Mary Kay (Bill) Sutton, and Matthew (Michelle) Wandall, her grandchildren Lindsay, Mitchell, Clarice (Travis) Warren, Caroline Sutton, Melody Sutton, Lucas, and Sarah, and her sisters Rosemary Friel and Roberta Reinhold. She was preceded in death by her parents and she was the grateful wife of Jack. A visitation is scheduled for Wednesday, July 26, 2017 from 3:00pm until 9:00pm at STRANG FUNERAL CHAPEL & CREMATORIUM, 410 E. Belvidere Rd., Grayslake, IL 60030. A funeral service is scheduled for Thursday, July 27, 2017 at 10:00am at the funeral chapel. Interment will follow at the St. Mary’s Cemetery in Mundelein, IL. For information, call 847-223-8122 or visit www.strangfuneral.org. Margaret R. Fischer, 101, a resident of Zion, IL, passed away on Friday, July 21, 2017 in Zion. She was born May 29, 1916 in Kokomo, Indiana to Able and Sarah (nee: Cornet) Parker. Margaret grew up on the family farm while living through the Great Depression. She worked at Western Southern Life Insurance in Cincinnati, Ohio. She moved to Illinois to be closer to her children and grandchildren. Margaret is survived by her daughter, Laura Branstetter; grandchildren, Lisa (Don) Jarrett, Robert (Connie) Branstetter, Valerie (Fred) Wicinski, Claudette (Stan) Gorsuch, Jackie (Frank) Kersey, Patti Holub; great grandchildren, Brian (Megan), Sarah, Mathew (April), Chelsea, Justin (Brandel), Kaity (Eric), Rebecca (Felipe), Courtney (Jourdan), Megan (Scott), Emily and James; and 12 great great grandchildren. She was preceded in death by her husbands, Lemoine Ball, Charles Houze, and Robert Fischer; daughter, Sharon Lee James; 3 sisters; 8 brothers; great granddaughter Laura Lynn and Son’s-in-law Jack James and Eldon Branstetter. A visitation and funeral service is scheduled for Wednesday, July 26, 2017 from 10:00am until 11:00am with the funeral service commencing at 11:00am at Strang Funeral Chapel & Crematorium, 410 E. Belvidere Road, Grayslake, IL 60030. Interment will be held at Highland Memorial Park. For information, please call 847-223-8122. James L. Osgaard, 88, a resident of Round Lake Beach, passed away Tuesday, July 18, 2017 at Advocate Condell Medical Center in Libertyville, IL. He was born April 14, 1929 in LaCrosse, WI to Leslie and Elsie Osgaard. James was a veteran having served for the Air Force. He was a member of St. Paul Lutheran Church in Round Lake. James is survived by his children Claudia (Rick) Niemann, Linda (Ross) Hart, Christine (Jeff Schultz) Skenandore, Robbin Annala, Cathleen Richards, Keith (Dawn) Schulz, and Colleen (John) Mitchell, his 12 grandchildren, and his numerous great-grandchildren. He was preceded in death by his parents and his wife June Osgaard. A visitation and funeral service is scheduled for Sunday, July 23, 2017 from 4:00pm until 6:00pm with a funeral service commencing at 6:00pm at St. Paul Lutheran Church 420 N. Greenwood Dr. Round Lake Park, IL. Interment will be held Monday, July 24, 2017 at 12pm at Oak Grove Cemetery in LaCrosse, WI. In lieu of flowers memorial contributions may be made to the church. All arrangements were entrusted to Strang Funeral Chapel & Crematorium 410 E. Belvidere Rd. Grayslake, IL 60030. For more information on services, call (847) 223-8122 or log onto www.strangfuneral.org. Cynthia Russeau, age 52, formerly of Gurnee, passed away at her home in Aldie, Virginia on Monday, July 17, 2017. She was born on November 26, 1964 in Pekin, Illinois. She graduated from the University of Wisconsin in Madison and was a loyal Packers fan. She worked for Abbott for 15 years. She is survived by her daughters, Elizabeth (Trevor) Weidner of Chicago and Katherine of Pleasant Prairie, Wisconsin; her parents, Donald (Connie) Joswick; one cousin, Kevin (Vickie) Martin; step-sister Michele (Mike) Kauffman; and half-sister, Angelina Pelini Bloome. Friends of the family may visit from 11:00 a.m. until 1:00 p.m. on Saturday, July 22, 2017 at Strang Funeral Chapel & Crematorium, 410 East Belvidere Road, Grayslake, IL 60030. A funeral service is scheduled for 1:00 p.m., immediately following the visitation. In lieu of flowers, donations may be made to the American Cancer Society. For information, please call 847-223-8122 or log on to www.strangfuneral.org. Mrs. Charlotte B. Eyre, (nee Mogg) 96, passed peacefully on July 7th 2017, in Newnan ,Georgia. Former Lake County resident of 77 years, she was born in Gages Lake, Illinois on July 25th 1920, daughter of the late John and Bertha Mogg. She was preceded in death by her loving husband Charles N. Eyre September 30th 1987 and by her sister Dorothy Swanson. She is survived by one daughter Linda (Richard) Petersen of Grayslake Illinois, two sons, Brian (Lynda) Eyre Abbeville Georgia and Bruce (Susan) Eyre Sharpsburg Georgia. 9 grand children, Gregory Eyre, Bradley(Cleta) Eyre, Kristin Eyre, Jason (Jessica) Eyre, Kyle (Jean) Eyre, Julie (Joe) Fischer, Wesley (Ronnie) Eyre, Brandon (Hayley) Eyre, Taylor Eyre, great-grandchildren, great-great grandchildren, nieces , nephews and cousins. Private Funeral service will be held on July 13th 2017 at Strang Funeral Chapel & Crematorium 410 E. Belvidere Rd. Grayslake, IL 60030 followed by interment at Highland Memorial Park Libertyville Illinois. Kenneth I. Molidor, 92 formerly of Twin Lakes, Wisconsin passed away on July 3, 2017 at Cherryvale Place with his family by his side. He was born in Round Lake, IL on August 8, 1924; to parents, William and Bessie Molidor. 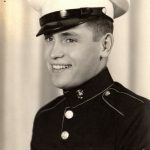 He graduated from Grant High School, proudly served in the United States Navy during World War II, worked as a meat cutter for more than 40 years, and retired from Shaffer Meat Packing Mundelein. Ken married his loving wife, Jessie M. (Keuhl) Molidor on August 12, 1979. Ken loved playing cards, golfing, making soup, and cheering on his beloved Chicago White Sox and Chicago Bears. He is survived by his daughter, Kimberly (Don) Vayr and stepchildren, Judith (Marvin) Neal, Susan (Robert) Sedler, and Emmett (Monica) Quill. Grandchildren, Kristin (Dan) Burns, Kayla (Andres) Marquez, and Bryan Vayr. Great grandson, Anthony Marquez. Step grandchildren, James (Sherry) Neal, Dawn (Bob) Vesneske, Josh (Trish) Sedler, Jenny (Nate) Martin, Michael (Janae) Quill, Pat (Heidy) Quill, and Katie Quill. 11 great grandchildren, and one great great grandson. Nieces, Judith Richardson and Margaret Bragado. Nephews, Raymond and William Litwiler. “Brousin” Jack Molidor, and many great nephew, nieces and cousins. Ken was predeceased by his parents; wife, Jessie; brothers, Raymond and Robert Molidor; sisters, Peggy House and Kay Dvorscak; nephew, George Schlung. The Molidor family would like to express their thanks to the staff members of Heartland Hospice and CherryVale Place for their loving kindness. A Memorial service will be held at 11:00 am, Friday July 14, 2017 at Strang Funeral Chapel, 410 E. Belvidere Rd., Grayslake, IL 60030. Visitation is from 9:00 am until 11:00am at Strang Funeral Chapel. Inurnment will follow at St Joseph Catholic Cemetery. In lieu of flowers, memorial donations can be given to Chicago White Sox Charities. Andrew Vargo, 93, a resident of New Jersey passed away July 8, 2017 at Condell Medical Center in Libertyville. He was born January 16, 1924 in Woodbridge, NJ. Funeral services in New Jersey will be handled by Costello-Greiner Funeral Home, 44 Green Street, Woodbridge, NJ 07095 (732) 634-0264. Local arrangements were entrusted to Strang Funeral Chapel & Crematorium, 410 E. Belvidere Rd. Grayslake, IL 60030. For more information please contact (847)223-8122. Susan Ann Mumford, 42, a resident of Fox Lake, IL passed away July 7, 2017 at Journey Care in Barrington, IL. She was born September 7, 1974 in Waukegan, IL to Robert and Elizabeth (nee Oshinski) Mumford. She was united in marriage to Richard Hammond in July of 2006. Susan is survived by her husband, Richard Hammond; sons, Tyler and Alexander Mumford; daughter, Breanna Hammond; mother, Elizabeth Mumford; sisters, Kathlyn (Paul Berry) Mumford, Laura Calhoun and Linda Mumford; brothers, Kenneth (Jami) Mumford, Steven Mumford and Edward Mumford; granddaughters, McKenzi Mannes and Arya Mumford. A visitation is scheduled for Wednesday, July 12, 2017 from 4:00pm until 8:00pm with the funeral service commencing at 11:00am on Thursday, July 13, 2017 at Strang Funeral Chapel & Crematorium 410 E. Belvidere Rd. Grayslake, IL 60030. Interment will be privately held. For more information please contact (847)223-8122.